Today is the Halloween parade at Camryn’s school. The kids put on their costumes at 2, march around the school & then promptly remove their costumes & go home. Why they aren’t doing this on Halloween instead of a regular Thursday is beyond me. Regardless, I made some chocolate glazed pumpkin donuts yesterday to help Cam get in the parade marchin’ spirit. Next to those two donuts is a fruit salad of mandarin oranges & watermelon. 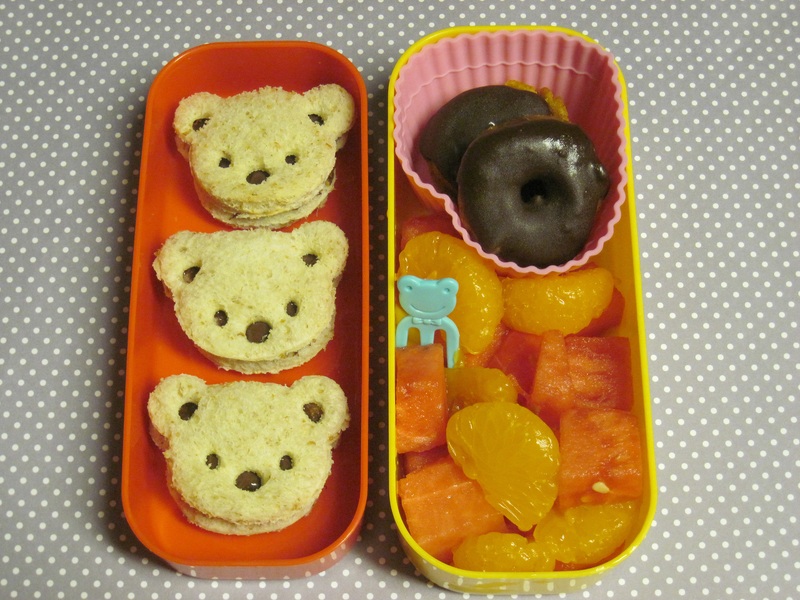 She also has 3 teddy sandwiches in the other tier of her bento. I also packed some crackers in a separate container so she’d have some salt to go with all that sweetness.